I doubt that many people would have seen this strip before. Taken from the Omnicon Convention 1976 book, which was housed in a brilliant Frank Brunner cover, it is more of a try out for Marvel Comics than anything else. 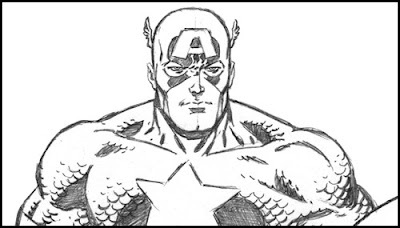 Before I start, I suggest that everyone go and visit Don Hudson's blog and check out the exquisite pencil scans that he's been posting of late. Mazzuchelli, Alan Davis - this is stuff you rarely, if ever, see these days, so if you like the comic book art, then check out Don's blog now. Plus Don is a great fellow indeed. Now, back to the topic at hand. Today marked the first day of the first such event to be held in Adelaide, the Armageddon Expo! For years Adelaide has been overlooked by such events by the promoters, with Brisbane, Sydney, Melbourne and Perth getting in on the act. Why do they overlook Adelaide? Ask them, not me, as I'm told my theories aren't exactly true. At least that's what I'm told in public, in private it's a different story. Welcome to March 2011, which, for those who read this blog will mean Mike Zeck & J.M. DeMatteis month. In the coming days and weeks, I'll be taking a look at some of the duo's best known work, through the eyes of artists, writers and collectors alike - so if you have something you want to share then drop me a line. Also there'll be plenty of original art, including some art that you might not have seen before in it's purest form, so keep checking back, and often.